FIANNA FAIL HAS announced that it would like to increase the length of training time for both primary and secondary school teachers. In its education policy document for the general election, FF says that it would add an extra year onto the Bachelor of Education degree course for primary school teaching, taking it from three years to four. The training period for post-primary teachers would be doubled under their manifesto, with the Postgraduate Diploma in Education (PGDE) being expanded from a one-year course to a two-year course. We supported a major report ten years ago that recommended that the length of the course be extended and successive Fianna Fail ministers have had the chance to reform it and haven’t. Teacher education is overcrowded – it asks students to take on too much in three years. We would welcome making it a four-year course but it would be a question too of how that extra year would be used. One of the things we would look at would be extending the length of time the trainees spend in a school placement. Minister for Education Mary Coughlan (FF) did not take up the INTO’s invitation to their conference in Dublin last Saturday, which was attended by around 800 primary teachers. The education spokespeople of the Labour, Fine Gael and Green parties were in attendance, said Mullan. The ASTI, which represents a majority of secondary school teachers, says that the association is “broadly in favour” of extending the PGDE course. Spokesperson Gemma Tuffy told TheJournal.ie that there has been discussion to that effect between secondary teacher representatives and the Teaching Council of Ireland. Mary Coughlan also referenced it in a paper on literacy which she released a while back. I suppose the question might be why are we talking about it and not implementing it. Saying that, the Teaching Council is relatively new so the process is ongoing. The Labour Party also launched its education manifesto today, entitled the Plan for Fairness in Education. The party proposes that all new school principal appointments will be for ten years only and that principals will be required to complete a Master’s degree in educational management. Principals will also be required to draw up five-year development plans for their schools. The INTO said that most primary schools were already drawing up development plans as a matter of course and that the limited tenure in a particular post was a reality in many areas of the public service. Gemma Tuffy of the ASTI said that there would be have to be assurances about what would happen to principals after ten years. “Would they have to leave the school, would they go back to the classroom to teach or would they assume another management role?” she asked. That clustering of services can be cost-efficient and it goes on a great deal anyway as schools try to make the best savings in this climate. An example I would think of is two schools in Kerry who share a physics teacher. They are two small rural schools, geographically apart, and they use video conferencing to share the teacher between the groups of students. So the teacher might have four students in front of them, and four others on a screen at the same time. However, Tuffy questioned the devolving of all services to local level. The National Education Welfare Board and the National Council for Special Education work quite well at national level and the disintegration of that structure might not necessarily result in any cost-economic benefit, she added. Introduce a “deferred payment facility” for third-level students. Responsibility for vocational education, training and apprenticeships to be transferred from FAS to further education colleges and Institutes of Technology. 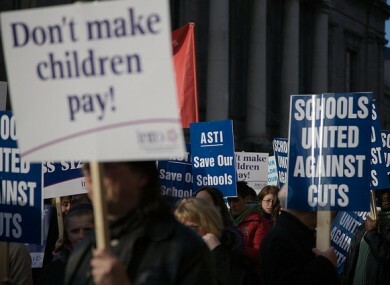 Email “Teachers' groups broadly welcome FF and Labour education plans”. Feedback on “Teachers' groups broadly welcome FF and Labour education plans”.